Only our factory survives today out of more than 10 noodles factories that formerly existed in Karumai. The other factories lost out to competition from giant noodle makers using cheaper imported raw materials. 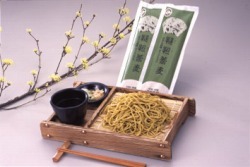 Even today, we at Furudate Noodles Factory, which was established in 1909, are committed to using locally grown grain and stringently observing the natural drying method, while striving to revive the regional industry in a joint effort with local farmers. 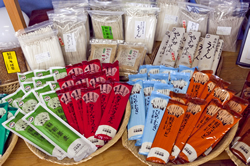 In addition to retail store sales, Furudate Noodles Factory runs an online shop. 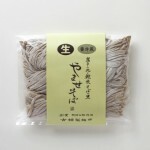 It offers a wide assortment of our products from Tartary Buckwheat Noodles and Tartary Buckwheat Tea made from domestically grown buckwheat to Soba Kakke hotpot sets and gift sets. We can have your purchase delivered anywhere throughout Japan. Please use this opportunity to send a gift to your family or others who matter to you. 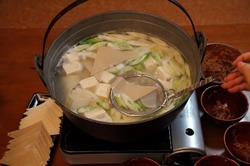 “Kakke”, a popular hotpot dish of local cuisine that brings out the original flavor of buckwheat, is an indispensable winter seasonal specialty of this snowy region. Look here(Sorry, Japanese only.) on how to cook delicious Kakke hotpot. There are other delicious ways to use Tartary buckwheat tea besides just drinking it as a tea. Look here(Sorry, Japanese only.) for details.